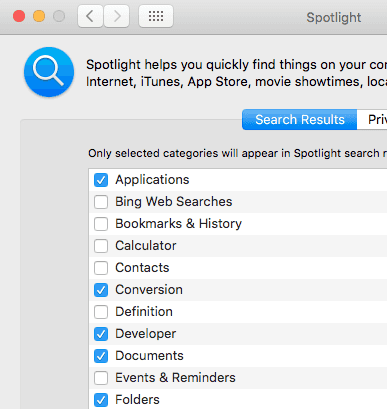 Mac spotlight search is one of the most frequently used tool on Mac. It searches various folders on Mac and shows results. Here are steps to make it faster by excluding some categories from search results. Click on system preferences (Launch tray or from spotlight). Locate spotlight icon and click on it. Select search results tab. Uncheck the categories you do not need in search results. Once done exit spotlight preferences window by closing it. Now try searching something. It should be faster depending upon how many categories were removed from spotlight preferences.